Australian Sarah MacDonald records her two-year adventure in India in the oddest ways. At times, especially at the end of the book, she is personal and shares her reasons for wanting spirituality in her life, but it’s a long wait for that. 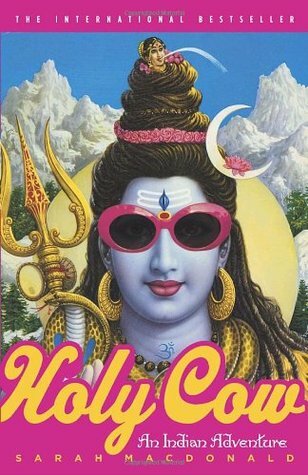 It seems more of a lark for most of the book- she visits religious festivals, temples, schools and synagogues in the most superficial way possible. Is it possible to sincerely examine 10 religions in two years? MacDonald demonstrates- it is not. MacDonald doesn’t get into the depths of any of these “religious” experiences. She announces she is an atheist and then seems to poke fun at some practices, yet she sporadically participates: dunks herself in the Ganges and gets sick; spends ten days in silence. ; has an interesting conversation with a rabbi. That aside, I love India and it was wonderful to armchair travel to places both previously visited and not. The descriptions of Pondicherry, Dharamsala, Vipassana, and Allahabad’s festival, Sai Baba’s ashram, and Amritsar’s Golden Temple, are full of fascinating detail. I was especially interested in the descriptions of the Parsi and Jewish communities. The descriptions of living with Indian servant in New Delhi were fun: the iron that was stolen, the need to accommodate two cultures in one house, the dance lessons. The writing at times tries too hard and distracts one from the story: “Perhaps Christianity has got something to give the world apart from Easter eggs, the Osmonds and guilt. For the first time, I see the faith, divinity and goodness in the faith of my forefathers.” That sentence structure (a comma’ed list of descriptors) is her favourite, sometimes used 4 or 5 times in a row! I think MacDonald failed to consider beforehand just how personal she would get in this account and so that aspect is annoyingly uneven. She worries about her boyfriend sometimes (he is a reporter covering regional tragedies including a trip to Afghanistan just days after 9/11), but because she covers their wedding in a paragraph and never shares much about this relationship, the reader doesn’t care about this faceless character. I often put the book down. In the time it took me to read it, I read two others which I heartily recommend: The Caliph’s House by Tahir Shah and The Bookseller of Kabul by Asne Seierstad. MacDonald could learn something from these humble thoughtful authors. Look, if you’re going to write something personal, you have to get personal- doing it self-consciously half-way is not satisfying to readers. Bare your soul or write a documentary.